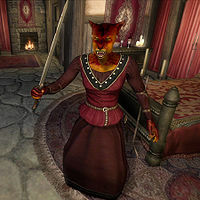 Tsarrina is a Khajiit thief and member of the Sirens gang operating out of Gweden Farm near Anvil. Unlike her compatriots, Faustina Cartia and Signy Home-Wrecker, she is never seen outside the farmhouse. She does not exist in the game before you reach stage 60 of the related quest. She will seemingly surface from the basement the moment Faustina shouts out the words "Ok, girls! We got someone who doesn't want to cooperate!" and proceed to attack you with the inevitable result. If, for some reason, she cannot find you, she will aimlessly wander around the cottage indefinitely. She is armed with a steel shortsword and wears a burgundy linen shirt, matching linens and a pair of thick cowhide shoes. She carries the basement key and a small amount of gold. The Siren's Deception: An all-female gang of thieves is preying on married men in the town. Although it is made to appear that Tsarrina is originally hiding in the basement, she is actually located in the upstairs area the entire time, initially disabled. Esta página foi modificada pela última vez à(s) 16h54min de 9 de janeiro de 2013.